South Africa has been cited as one of the most energy intensive countries in Africa due to its large mining sector and it has been difficult to tackle carbon dioxide emissions as mining contributes to 60% of South Africa’s exports (World Development Indicators, 2012).The biggest problem for South Africa has come in the form of its coal reserves, which are the largest in Africa. South Africa relies on its coal reserves for 67% of its energy use, which has resulted in South Africa becoming one of the largest carbon dioxide emitters in the world, alongside its fellow BRICS nations (World Development Indicators, 2012). However, Eskom, South Africa’s public electricity utility company, has begun investing in renewable energy and has plans for three wind farms across South Africa (2014). In the mean time, Eskom and scholars alike have been trying to promote energy efficiency and the divestment of large industries from coal. South Africa has the largest gross domestic product (GDP) per capita in Africa, which the World Bank estimates will reach $11,914 (PPP) by the end of 2014. Since its independence in 1994, South Africa has shown economic prowess and has joined Brazil, Russia, India, and China (BRICS) to form an association of the five largest emerging economies in the world. It is the only African country represented at the G8+5 and G20 summits and made history in 2010 by becoming the first African country to host the World Cup. According to World Development Indicators (2012), 84% of South African households have access to electricity and Eskom, South Africa’s public electricity utility company is the largest in Africa. However, despite the leaps it has made in economic and social development, South African have been left in the dark by two energy crises in 2008 and in 2014. 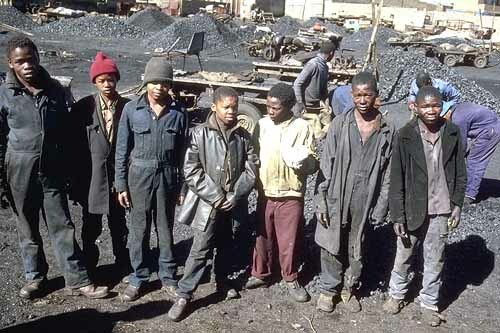 Scholars have argued that the ‘wet coal phenomenon’, the mismanagement of Eskom, and the energy dependent countries that South Africa supplies electricity caused these crises. Though the energy crises of 2008 and 2014 were treated as acute and separate incident but there is evidence that South Africa underlying related factors that need to be addressed by Eskom, large industries, and consumers before they are left in the dark by another crisis. This entry was posted in Fossil Fuels, Monkgogi Otlhogile and tagged Coal, Eskom, South Africa by Emil Morhardt. Bookmark the permalink.